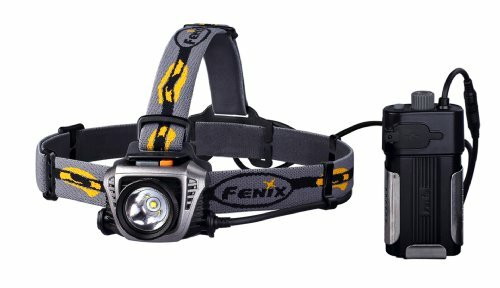 The Fenix HP30 Headlamp employs high-capacity, belt-mounted 18650 cells to generate 900 lumens in Burst mode, 500 lumens in High output. An extended 233m beam distance reaches farther while the detachable diffuser lens switches quickly from spot to flood. When needed, the battery box USB port stands ready to power critical navigation and communication devices. Features Utilizes Cree XM-L2 LED with a lifespan of 50,000 hours Uses two 18650 batteries or four CR123A batteries Light size：69.9mm (Length) x55.9mm (Width) x43.8mm (Height) Battery box size：116.6mm (Length) x56.3mm (Width) x29.6mm (Height) 276.5-gram weight (excluding batteries) Digitally regulated output maintains constant brightness Lockout function - prevents the light from accidental activation Detachable diffuser lens Remote battery case with USB output 60-degree tilt mechanism Reverse polarity protection guards against improper battery installation Made from durable aluminum alloy and performance plastic Toughened ultra-clear glass lens with anti-reflective coating"